We are a 5-star VELUX installer. This means that we are VELUX specialists, offering a wealth of knowledge about the VELUX range in Newcastle. With our VELUX roof and Skylight installations team you are assured quality service and affordable prices. With a vast range of windows to choose from, our VELUX window and Skylight fitters will help you make the right choice for your home or business. VELUX windows and Skylights can make all the difference to your premises, opening the space up and providing natural light so that you can make the most of the environment indoors. Call VELUX Installation Newcastle and speak to our experienced window fitters today. 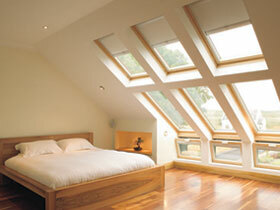 We offer affordable prices on all our VELUX products, from skylights to sun tunnels and roof windows. Speak to the team in Newcastle now for a free estimate and advice. We’re not just VELUX experts. Our professional team in Newcastle can also offer services to prevent or repair leaks too. We are experienced roofers offering services such as roof repairs, general maintenance and emergency repairs to help keep your property in top condition. Call VELUX Installation Newcastle to discuss your requirements with us today. This entry was posted in Skylights and tagged fitters, installations, Newcastle, roof, skylight, Velux, window. Bookmark the permalink. Hi, the glass in two of my Velux windows has failed. They are GGL-1 and GGL-4. Please provide a quote for replacement glass and fitting of both windows. I live in north Newcastle upon Tyne.